Darwin edited this sumptuous work, which appeared in five parts, made up of nineteen numbers, between February 1838 and October 1843. Early in 1837, he was considering asking for government help to publish the zoological results of the voyage as a book. In May that year he received the support of the Duke of Somerset, President of the Linnean Society, as well as of the Earl of Derby and of Professor William Whewell. On August 16, he called on the Chancellor of the Exchequer, Thomas Spring Rice, who told him that the Lords Commissioners of the Treasury had granted £1,000 towards the cost. Even so this was not enough, and the preface to Geological observations on South America, p. [iii], states that the publishers and he himself had advanced further sums. A prospectus, a single sheet 214 X 134 mm printed on both sides, was issued between August 16 and November 4. It gives the names of the five experts who were to cover the vertebrate groups, but states that 'a description of some of the invertebrate animals procured during the voyage will also be given. 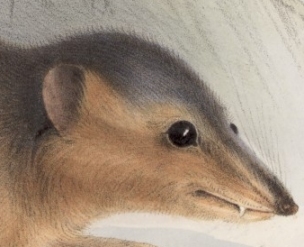 At the conclusion of the work Mr. Darwin will incorporate the materials which have been collected, in a general sketch of the Zoology of the southern parts of South America'. Neither of these intentions was realized. Darwin contributed a geological introduction to Part 1, the Fossil Mammalia (pp. 3-12), and a geographical introduction to Part II, the Mammalia (pp. i-iv). He also contributed notices of habits and ranges throughout the text of Mammalia and Birds, and there are frequent notes, mostly from his labels, in the text of the Fish and the Reptiles. The authors of the parts were Richard Owen (Fossil Mammalia), George Robert Waterhouse (Mammalia), John Gould (Birds), Leonard Jenyns (Fish) and Thomas Bell (Reptiles). One issue only; it has not been translated, but there is a facsimile of Part V. reptiles. A three volume facsimile was published by Nova Pacifica in 1980, No. 1899, in The Works of Charles Darwin published by Pickering, 1986-1989 and a four volume edition by CIL Limited in 1994. The numbers were issued as they were ready, the first, by Professor Owen, being announced for January 1st 1838, but not appearing until February. The original intention, given in the prospectus, was to publish 'on the first day of every alternate month; and the whole, when completed, will comprise about six hundred pages of letter-press, and from two hundred to two hundred and fifty engravings'. The final result was 632 pages, but only 166 plates. Darwin seems to have had some difficulty in keeping his authors up to time; indeed Professor Bell took almost five years to produce fifty pages, thus delaying the completion of the work for eighteen months. John Gould went to Australia in the spring of 1838, and the remaining text and the corrigenda of the Birds were written by George Robert Gray, of the British Museum. This is explained on a preliminary leaf issued with No. III, Birds, I. Parts title leaves, with half titles, preliminaries, indices and lists of plates, were issued with the last number of each part, except for a cancel title to Mammalia which was issued, with an errata slip, with No. XI, Birds, IV, the cancelland lacking the author's name. In volume form, the note about Gould is transferred to the rest of the preliminaries which were issued with No. XV, Birds, V. The editing is excellent: there is only one cancel, the title leaf to Mammalia, noticed above; there are few errata noticed and no bis plates. I have seen a temporary title leaf for Birds, issued with No. III, Birds, I., and those for the other four parts may exist. C. D. Sherborn (Ann. Mag. nat. Hist. Vol. 20, p. 483, 1897) has listed the dates of issue of the numbers as given to him by the publishers, and these correspond to the dates printed on the numbers themselves. Unfortunately, he calls each number a part, whereas the set, as mentioned above, consists of nineteen numbers, which together make up the five parts. The full details of the issue in numbers are given in No. 8, and those for the parts issue and the same in volume form in No. 9. Inserted advertisements may vary from set to set, but there are usually four pages of publisher's general advertisements in Numbers III and IV; an advertisement for the forthcoming geological results, in a form in which these never appeared, in Number V; and a notice to subscribers to Sir Andrew Smith's Zoology of South Africa in Number XV. I have however seen the geological advertisement in Number VII. The unbound parts cost £8. 15s. and the publishers advertised the completed work as available 'in half russia or cloth binding, at small addition'. The English Catalogue gives a price of £9. 2s. for the bound work. I have not identified the publisher's half russia, but the original cloth casing was in five volumes, one part in each. Copies also occur in publisher's cloth in three, Fossil Mammalia and Mammalia in the first, Birds in the second and Fish and Reptiles in the third. This form was, presumably, later than that in five, but no volume titles seem to have been issued for it. Darwin, C. R. ed. 1842. Fish Part 4 of The zoology of the voyage of HMS Beagle. by Leonard Jenyns. Edited and superintended by Charles Darwin. London: Smith Elder and Co. Text Image PDF F9.4 Courtesy of the Trustees of the Natural History Museum (London).